Accommodates wires from 18 AWG to 42 AWG. Using the four winding heads available,core sizes from .055" I.D. (1.40 mm)to 4" O.D. (101.6mm)can be wound. Ball bearing four roller drive rotates theshuttle at speeds up to 2000 turns per minute using the 4" head. Thirty-three sizes of easily removableprecision shuttles permit a large variety of cores to be wound. Electronic counters guarantee accuratecounting. Dual preset electronic counter — standard equipment (one for loading,one for counting turns). Three powered driving rollers insurepositive rotation of the core through a variable speed range. leaving the shuttle on the rollers. Whenthe shuttle must be removed from the head, there is a shuttle release lever onthe left side of the head. The TT-H06 is available with either a fouror six inch winding head and interchangeable light or medium duty 360 degreecore rotators. The light duty rotators will handle cores from .100" (2.54mm) to 2.0" (50.8mm) O.D. The medium duty rotators will rigidly holdand rotate cores from .625" (15.88mm) to 4.0" (101.6mm) O.D. The core is held between three rubberdrive rollers and all three rollers are simultaneously driven for positive corerotation, even over irregular prior windings. Power Core Jog is now available for quicklyindexing the core to a new position. A belt winding head of new design isavailable for winding heavy wire through small residual holes which previouslyhave had to be wound by hand. Winding cycles of down to 20 seconds are nowpossible, competing with hand winding with as little as ten turns with this newhead. Nine belt shuttles are available for the 4" (101.6mm) belt head and 5 beltshuttles for the 6" (127mm)head. The exclusive WISDOM Jockey Stick CorePositioning Device is standard equipment with the TT-H06. It can be locked inposition. All WISDOM Toroid Winding Machines use thepatented Delrin and rubber shuttle driving rollers for long and silent running,a drive which maintains the high polish of the shuttles, reducing thelikelihood of inside coil damage and shorted turns by accidental rubbing by theshuttle. The smaller shuttles are of circular ratherthan angular cross section giving more wire storage per shuttle size. Machines can be equipped at factory for220V 50/60 cycle operation at a small additional charge. All internalelectrical components are of bolt-on or plug-in construction assuring years ofcontinuous use and trouble free service. belt converts it into a side slider of wireslider type. sliders and side sliders commonly used. little more than half of the circumference. The shuttle is driven by four internalrollers in the usual manner and the toothed belt is driven by a toothedpulley,so that its motion will coincide with that of the shuttle. The magnet wire being pulled from theshuttle, down through the toroid is pulled tightly about the toroid by itssliding between the shuttle and the tensioning belt riding on top of theshuttle. The shuttle is loaded and winds the toroid in the same direction. 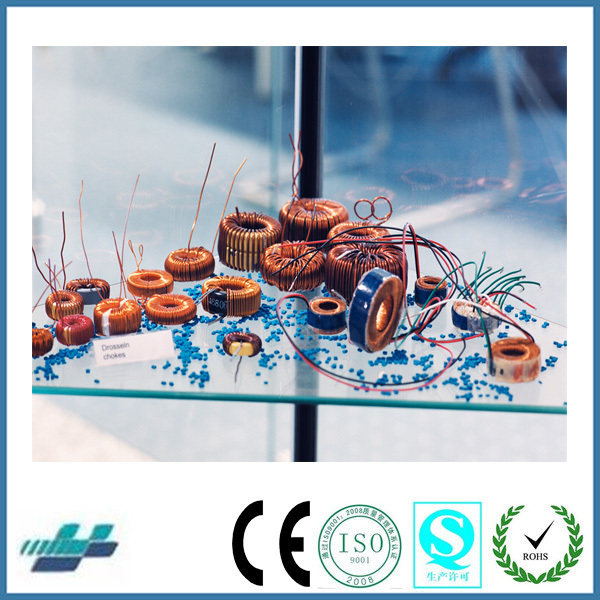 The wire size range of the Belt Head isnormally from #18 to #35 AWG with a shuttle as small as .093" (2.36mm) cross section atpresent. Due to the simplicity of operations,complete bench to bench cycles of up to 3 per minute are now possible, greatlyreducing the once high cost of winding toroids. Wires as heavy as #18 AWG can be wound withthe new 6.0" (152.4mm)x .500" (127mm) beltshuttle.